I've been sort of obsessing over Fage Greek yogurt lately. It's so affordable at Costco. It's been heavenly with blueberries, honey and granola in the mornings, but the tart, creamy yogurt is also a great ingredient for salads and dips. My sister and I catered my baby shower Sunday and we purchased the ubiquitous veggie platter with a bland cream dip in the middle. I chucked the plastic container for something homemade and it was a big hit. The secret ingredient is a Bulgarian puree of roasted red peppers and garlic. I found it in the exotic grocery section of Wal-mart, believe it or not, and I use this stuff for pasta dishes, salads and pretty much anything I want to add a little zing to. Most grocery stores I've been to have some sort of version of this stuff. Otherwise, this recipe is pretty simple. Fresh herbs are best, but I'm sure you could toss in some dried basil or oregano and it would still be outstanding. Mix together all of the ingredients. 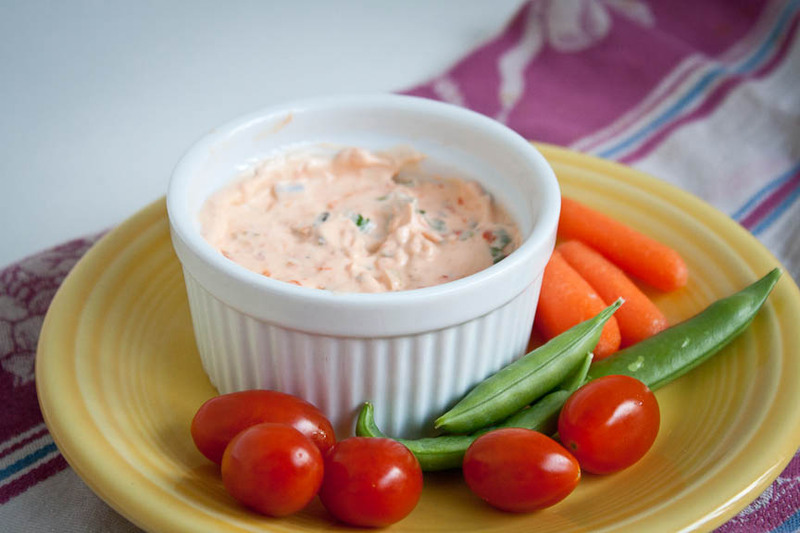 Taste your dip and add more red pepper puree if you'd like. Refrigerate for at least an hour for flavors to meld.